Director – Frank Marshall, Screenplay – John Patrick Shanley, Based on the Novel by Michael Crichton, Producers – Kathleen Kennedy & Sam Mercer, Photography – Allen Daviau, Music – Jerry Goldsmith, Visual Effects – Industrial Light and Magic (Supervisor – Scott Farrar), Gorillas – Stan Winston, Makeup Effects – John E. Jackson & Matthew Mungle, Production Design – J. Michael Riva, Ape Performer Choreographer – Peter Elliott. Production Company – Kennedy Marshall Productions/Universal. Dr Karen Ross, a communication scientist with TraviCom corporation, receives a satellite broadcast from her e Charlie Travis in the Congo at the entrance to a ruined city. He has found a fabulous diamond that his father, the corporation head, wants for a communications satellite. However, several hours later, when transmission resumes, they find that the expedition has been attacked and destroyed. 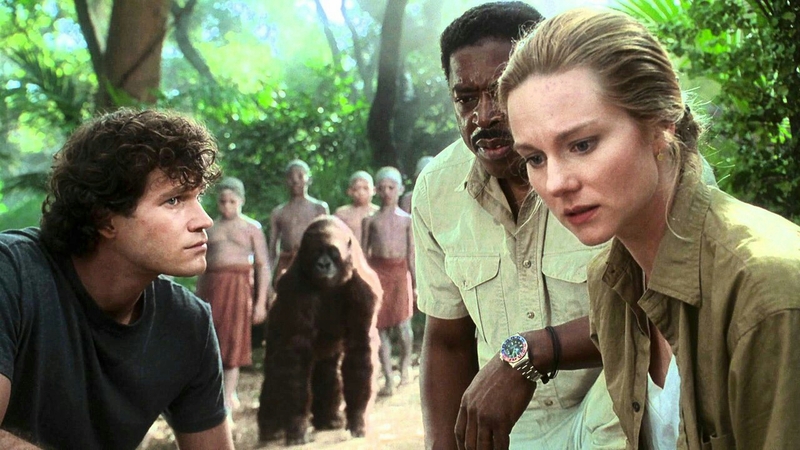 Charlie’s father prompts Karen to go to the Congo and investigate, although he appears more interested in finding the diamond than his son. Karen co-opts the expedition of primate anthropologist Peter Elliot, who has trained his ape Amy to speak using a vocaliser that interprets sign language but who now wants to return Amy to the wild. They are joined by the Rumanian Herkemer Homolka, who is in search of the lost city of Xinj, which he is certain was the source of the legendary King Solomon’s Mines. Landing in the Congo, they find themselves in the midst of civil war. As the expedition nears Xinj, they discover how the city’s original inhabitants selectively bred gorillas for intelligence and aggressiveness, resulting in a breed of dangerously intelligent apes that guard the ruins. There is an interesting dichotomy that ran through the work of novelist and sometimes film director/screenwriter Michael Crichton. Whether discussing virology, dinosaur genetics, Japanese culture, the politics of airline disasters or sexual harassment law, Crichton puts an amazing degree of research into his work – his novels even come littered with schematics and graphs. Indeed, Michael Crichton’s science-fiction works often read more like scientific papers than novels. He had a fascination with technology – even non-sf thrillers like Rising Sun (1991) and Disclosure (1993) are littered with cutting edge gadgetry – yet at the same time Crichton feared very much the possibility of that technology running rampant. Yet for all the humanity that Michael Crichton tried to defend, his characters were virtual blank ciphers, with the result that what remains in Crichton’s books are not pleas for humanity but coolly efficient techno-thrillers that seem to repudiate the very science they seem so fascinated with. During the 1970s, Michael Crichton made his debut as a film director and during that time was responsible for two great science-fiction films – The Andromeda Strain (1971) based on his novel, Westworld (1973) – and one halfway good one – The Terminal Man (1974). His directorial career petered out in the 1980s amid mediocre, half-fulfilled ideas – Looker (1981), Runaway (1984). Michael Crichton’s technological alarmism was particularly suited to the 1970s brand of antiseptically-white, techno-triumphant dystopia, but he soon appeared to be stuck on a single track alarmist note, something that eventually ran out after cinematic science-fiction became far more upbeat in tone regarding technology following Star Wars (1977). Then however came the amazing success of Jurassic Park (1993), adapted from Crichton’s book, and suddenly Michael Crichton was a best-seller and box-office gold again. Although he never took up the director’s chair again, his books inspired a spate of successful A-budget adaptations – Rising Sun (1993), Disclosure (1994), Congo here, the original screenplay Twister (1996), The Lost World: Jurassic Park (1997), Sphere (1998), The 13th Warrior (1999), Timeline (2003) and the tv mini-series remakes of The Andromeda Strain (2008) and Westworld (2016– ), with Crichton also having created the medical tv drama ER (1996-2009). With Congo, originally written in 1980, Crichton said that his challenge was to write a modern version of H. Rider Haggard’s classic adventure tale King Solomon’s Mines (1885) and update the old lost world formula. The lost world story was always an exotic romance born of the late Victorian era, rooted both in the great Age of Exploration and in a fascination with the prehistoric past that the then-new sciences of evolution and palaentology were opening up to the Victorians. The genre’s appeal was limited to the time the world began to be geographically closed off ie. the point when exploration of the jungle regions and the Poles lost their mystery, revealing a lack of plateaus containing dinosaurs or hollow Earths to be found there. Science Fiction cinema kept the lost world theme going until the 1950s after which the genre fairly much dried up. There were odd throwbacks in the 1970s such as Amicus’s Edgar Rice Burroughs trilogy begun with The Land That Time Forgot (1974) and Disney’s The Island at the Top of the World (1974) but these were notably period pieces, set in the past to evoke the romance of the Victorian Age of Exploration. Congo interestingly blends the cliches of the genre – lost cities, mysterious native tribes, unknown animal species, the search for King Solomon’s Mines, the exploding volcano climax – and updates them with modern interpolations – Central African political instability, modern primate anthropology and an eco-conscious attitude toward vanishing species, along with cutting edge technology. Congo was the third film directed by Frank Marshall. Marshall is better known as Steve Spielberg’s Executive Producer, having worked on every Spielberg-associated production from Poltergeist (1982) onwards throughout the 1980s and most of the 90s. Frank Marshall’s two previous films as director, Arachnophobia (1990) and Alive (1993), were slick but forgettable A-budget pieces. Congo is three-quarters of a good film. I say three-quarters because this is the length of time that Congo spends on the journey to the lost city. This is exciting and cannot be faulted. 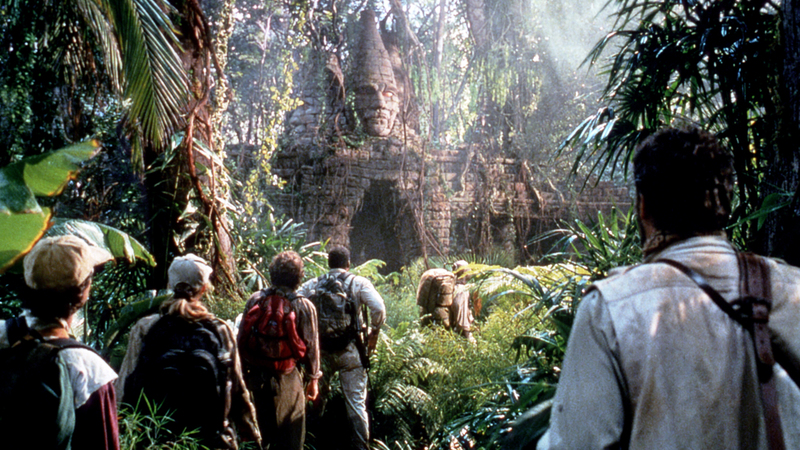 Once at the lost city however, Congo almost appears at a loss for what to do and falls back on genre cliches. Despite an impeccably Green attitude towards its primates throughout – frequent mention of how their aggression is a cinematic myth, the prominent featuring of posters listing the population of remaining gorillas in the world – the film all too eagerly throws that away for a climax that features the cast fighting off aggressive gorillas and apparently all in favour of endangering the species. The climax also suffers from many of the usual problems of the lost world film. Lost world films only operate as exotic armchair safaris. Once at their locations they are largely confined to tourism, dramatically limited to providing thrills and spills, maybe a touch of romance with a fur bikini-clad girl, but not a great deal more. The reason most lost world stories cap everything off with a volcanic explosion – an appalling cliche rehashed here – is possibly their lack of anywhere else to take the story. The story in Congo suffers from many loose ends. Interesting character possibilities are raised – Laura Linney is first introduced as a professor of communications engineering but as she progresses we get interesting hints about a CIA background and she appears amazingly proficient with hi-tech weaponry – yet none of this is explained and the character remains irritatingly vague. Similarly with Tim Curry’s philanthropist, much is hinted at in the way of an unscrupulous background – he may not even be a rich philanthropist as his ‘temporary cashflow crisis’ at the airport seems to suggest – but nothing ever comes of this, although he still gets the type of deservous death (while scrabbling for wealth) that the greedy usually do in these films. Congo is well served by a good cast. Laura Linney made her screen debut here, before a few years later going onto roles in Primal Fear (1996), The Truman Show (1998), Mystic River (2003), Kinsey (2004) and becoming a strong indie film actress and receiving several major award nominations, including three Academy Award nominations. Her tough and capable heroine is refreshing. There is also a fine performance from Ernie Hudson, who creates the sort of worldwise, sharp humoured adventurer that one could easily imagine going on to star in his own series of films. The only weak performances in the deck are Tim Curry’s one-dimensional Homolka and Dylan Walsh, later the star of tv’s Nip/Tuck (2003-10). One is not sure if Walsh’s performance has been intended so deliberately in order to highlight the strong woman’s role, but he is played as a wimpy wet blanket the whole way through. Other films adapted from Crichton’s books include:- the extra-terrestrial virus film The Andromeda Strain (1971); the neurosurgical Frankenstein film The Terminal Man (1974); Jurassic Park (1993); Rising Sun (1993), a superior adaptation of Crichton’s blatantly racist book about Japanese business practice; Barry Levinson’s adaptation of Disclosure (1994), Crichton’s novel about sexual harassment, which contains some sf elements; The Lost World: Jurassic Park (1997); Sphere (1998) about the investigation of a crashed UFO; John McTiernan’s The 13th Warrior (1999), an historical epic about the meeting between Vikings and Neanderthals; Richard Donner’s dull adaptation of Crichton’s Timeline (2003) about time travel to Mediaeval France; the tv mini-series remake of The Andromeda Strain (2008); and the tv mini-series remake of Westworld (2016– ). Michael Crichton’s other works as director include:– Westworld (1973) about an android amusement park that goes amok; the medical conspiracy thriller Coma (1978); The Great Train Robbery (1979) about a Victorian train heist; Looker (1981) about virtual models; Runaway (1984) about a police force to stop amok robots; and the courtroom thriller Physical Evidence (1989). Crichton also created the hit hospital drama ER (1996-2009) and wrote the original screenplay for Twister (1996) about tornado chasers. (Nominee for Best Supporting Actor (Ernie Hudson) and Best Makeup Effects at this site’s Best of 1995 Awards).